Let’s go on an adventure together. 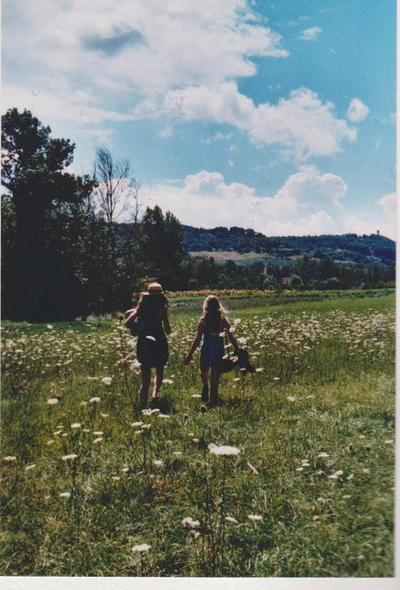 We can dance in meadows of fluffy dandelions and watch the seeds fly away on the breeze like tiny pale fairies. We can pick a bouquet of wildflowers as a gift for our mothers for when we go home. We can chase and catch butterflies in a jar and then set them free again, because everyone deserves to be free. We can have a picnic in the scented grass and invite everyone we know –a big checked spread; jam and scones, lemonade, popping candy. We can take silly photographs of ourselves with disposable cameras and wear daisy chains like diamonds around our necks. We can blow soapy bubbles and laugh until our stomachs hurt. We can play hide-and-seek in the woodland and scratch our knees climbing too-tall trees. We can pick bramble berries till our fingers turn pink and eat them all on the walk back. We can buy whippy ice creams – the ones with a flake in – and lick them as we watch the sun go down in blue, purple, pink, grey. When night falls, we can stay up and lay there spotting constellations – if we’re lucky, maybe a whooshing firework or two. We can toast marshmallows on the fire and tell each other scary stories, wide eyed tales and secrets we thought we’d never share. We can fall asleep curled up in light blankets, cricket-song as a lullaby and the moon as a nightlight. We can weave the day’s memories into our dreams as we sleep. I’d love to go on an adventure with you some time. This entry was posted in Writing and tagged adventure, free write, friendship, prose. Bookmark the permalink.